I was scared to try and make balloon animals when I was a kid. The anticipation of the balloon popping drove me nuts. I really just liked to inflate them and then let them fly around the room. I wonder if anyone has invented an air compressor attachment that is a rapid fire balloon inflater/launcher. I guess that wouldn’t be a very accurate weapon. Book #4 preorder available now in the store! My favourite kind of Biff joke, this one. The kind of thing that just makes you facepalm at what Biff was trying to do. Actually, “snake” is pretty good for a water-ballon animal. I can make a water balloon Pat Sajak’s head and a paramecium and a French Poodle…out of the same balloon…at the same time. Ha! Try harder, Biff. Takes some practice. THAT woulda ended with a bang. At first I thought it was blood what covered Biff, so I had problems reading the text correctly. At some point I read water-mellon animals, probably an unconscious attempt to turn the blood into something harmless. Not sure if we’ve ever seen Biff with a “WTF?” look on his face until now. I totally thought that was blood on Biff, and that he was trying to make water balloons out of animals. Remember in “Shrek” (or is it Shrek 2?) when he makes a snake into a baloon? I thought that was what Biff was doing. Took me a few disgusted seconds to realize he is just making animals out of water baloons. Anyway, I think it might work if you remember to leave more slack in the baloon. Like when making air-baloon-animals you don’t fill the baloon all the way or it will pop, it should work with water as well. But that is gonna be a very heavy baloon, those are pretty big baloons that they use to make animals out of. I also initially thought of shrapnel wounds… But whatever. The fact is, Ic an’t make regular balloon animals, unlis you count ‘stick’ or ‘banana’ as a baloon animal. 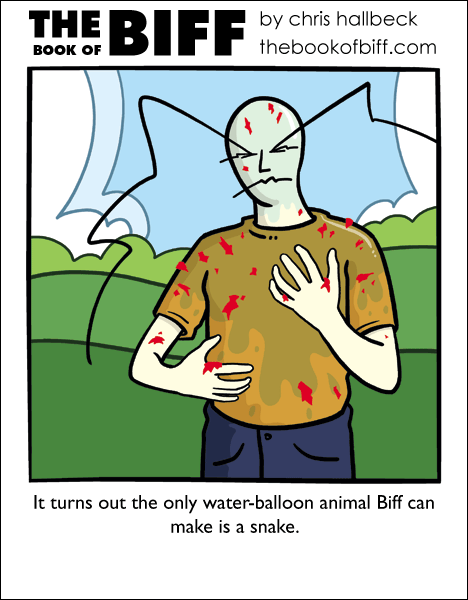 No doubt, water balloon animals *would* give me shrapnel wounds! it’s the effort that counts biff. My favorite balloon trick was in the movie ‘The Mask’. I’ve been trying to figure out how to make a balloon Tommy-gun ever since. Try again, Biff. Try again. I hate when balloons pop. I’m guessing it’s summer week. Hmmm…I have enough for the best set of 4 books while the dollar is still weaker than Sterling…but the XKCD store is so tempting..and my wall is so bland!!! !